Situated in Eastern Europe this country is also home to multi-ethnic population known for its tremendous biodiversity. Ukrainians have a close relationship with nature & sending flowers are the most common gifts to express their love & affection. In Ukraine never miss an occasions like Birthdays, Anniversaries, Mother’s Day or Valentine’s Day to gift flowers to your loved ones. Roses, Chamomile Flowers, Azaleas, Orchids, Lilies, Irises, Dipsacus, Rhododendrons, Daisies, Chrysanthemums and Carnations are some of the popular choices for gifting. Flowers should be in odd numbers and avoid giving yellow. Send flowers same day to Ukraine using our local florists & flower shops. Order by 12 noon. Send Easter Flower Arrangement, Easter Hampers & Gift Baskets to Ukraine. Send Roses, Carnations, Lilies throughout Ukraine for occasions like Birthdays, Anniversaries, Funerals, etc. Enjoy affordable flower delivery across Kiev, Kharkiv, Dnipropetrovsk, Donetsk & nationwide delivery. How do i send International Flower Delivery to Ukraine? 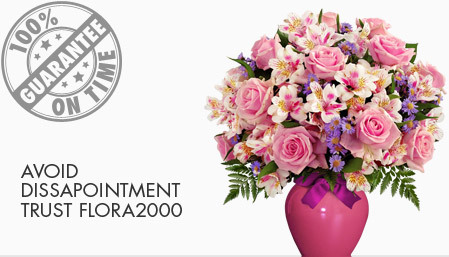 Flora2000 has transformed International flower delivery to Ukraine into a fine and effortless art. With our efficient flowers & gifs delivery services worldwide; you are sure to find the perfect expression of your message to your loved ones. Be it Roses, Lilies, Carnations or Cakes, our gifts are sure to make both the sender and the receiver happy. We make sure the gifts you give reflects what you feel about the receiver. Ukraine is situated in Eastern Europe. It is also a home to multi-ethnic population. Ukraine is also known for its tremendous biodiversity. People in Ukraine have a close relationship with nature. Flowers are the most common gifts to express their love & affection for occasions like birthdays, anniversaries, mother’s day, valentine’s day etc. Roses, Chamomile Flowers, Azaleas, Orchids, Lilies, Irises, Dipsacus, Rhododendrons, Daisies, Chrysanthemums and Carnations are some of the popular choices for gifting. Flowers should be in odd numbers and avoid giving yellow and expensive gifts. We have an exclusive collection of flower arrangements, hampers & baskets for this Easter. Our classy collection of flowers & Gifts for Easter to Ukraine.